school officially starts today for my 9, 6, and 5 year olds. if you hear the sound of clinking glasses, it's coming from the party being held at my house. don't get me wrong, i love summer and time with my kids. there's just something about having them in separate rooms with their own friends occupied all day on someone else's watch that makes me blissfully happy. monday we met their teachers and were handed the packets of mindless paperwork to fill out before the first day of school. 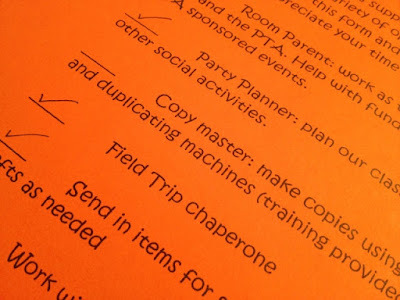 i've sat for hours doing "mommy homework" and have came across three similar sheets, one for each child. 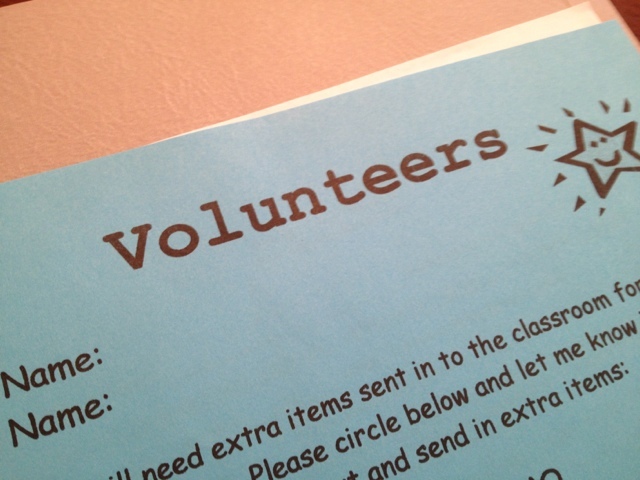 it is the dreaded volunteer sign up sheet...in triplicate. don't get me wrong, i want to help out in my children's education. i've sent in extra school supplies, party supplies, pretty much any supplies asked for. 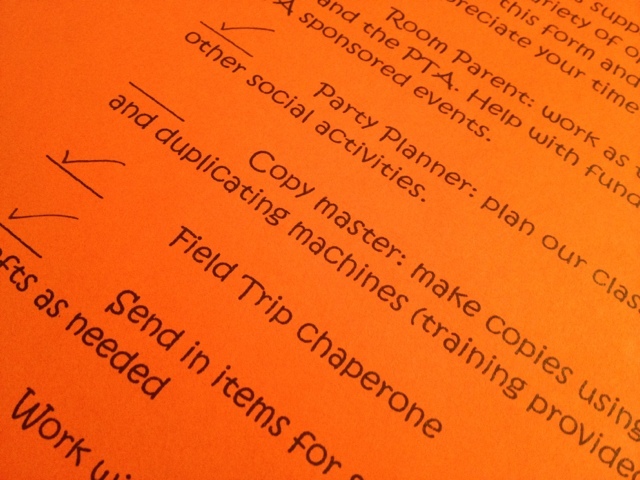 i try to chaperone one field trip a year. i write checks on what feels like a daily basis. i'll even cut out projects for the kindergarten classes. still, i've never had any commitment beyond what i can accomplish generally within the walls of my home. this year is much the same. i have two little people at home who are my built in excuse. having a two year old and a six month old in tow is somehow frowned upon when heading in to volunteer in the classroom (can't imagine why). still, this year i'm somehow compelled to try to do more. i think there must be something wrong with me. maybe it's the sadness over sending three of my kids off this year (*see the party reference above...i'm clearly not that upset by it). maybe i just feel guilty that i haven't signed up for anything like it before. maybe i just want my kids to know i've got their backs. 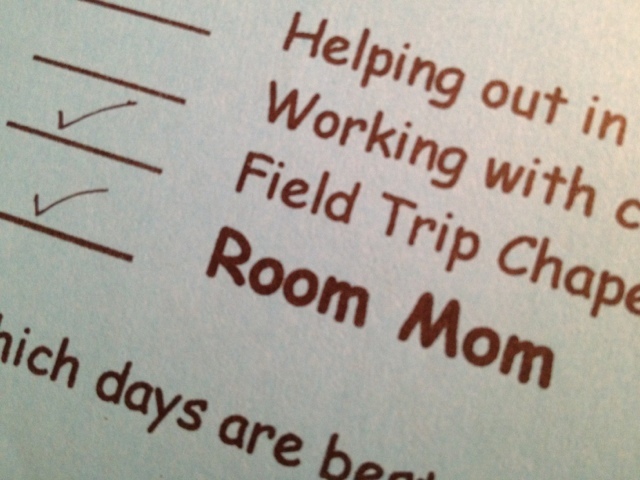 regardless, this year i'm checking the "room mom" slot. i'm not sure if i'll get it. maybe there's a lot of competition out there for room mom. i have no idea. this is uncharted territory for me. still, i think i can handle it. after feeding five kids dinner every night, could it really be *that* difficult? i will definitely keep you posted. if you have room mom experience, help a sister out. if you think i should back out and run for the hills...there may still be time. if you think i'll love every minute of it...i'll take that too. just let me know i can make it to the room mom island and survive. at this point, that's good enough for me. I'm Signing Up To _____, And Here's Why! I’m joining VolunteerSpot’s Back To School campaign to help raise visibility for parent involvement in schools. Plus there's a huge Sweepstakes on VolunteerSpot's Facebook page! just one, jodi, just one. i'm not that crazy. we'll see how it goes! I definitely know you can survive on the island...I have held the position for 2 years (with an infant, toddler) same kid of course. Feel free to use the little ones! Enjoy the party!! if you can do it, i can do it. thanks for the encouragement. i'll keep you posted! I am feeling bad for not signing up for what would be my 7th year as room mom. I am pretty sure I will get snagged into something but was PTO president for the last 2 yrs too. Can a girl take a break! Seriously, you will enjoy it but keep it simple! absolutely a girl can take a break! you enjoy this year away from the "room mom" title. sometimes when we take a step back, it helps someone get involved who might otherwise have not. it's always a win-win. enjoy your year break!